Get this on the go with the Superbalist app – give us your mobile number to receive the download link on your phone. Please provide your mobile number to receive a one-time SMS, to download the Superbalist app on your Apple or Android device. Standard Delivery is available to all areas in South Africa and is free for orders over R450. Collection is available from Takealot Pickup points. Faster delivery options may be available for your order during Checkout if you’re based in Cape Town, Johannesburg or Pretoria. 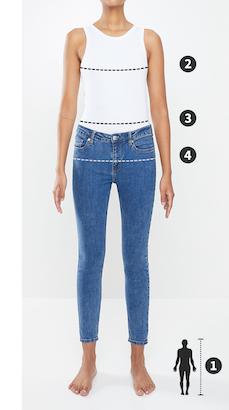 Please note that Superbalist women’s clothing sizes are designed to fit the following body measurements. Some brands may vary from these measurements but the table can still be used as a guide. To determine your bust size, wrap a measuring tape around your chest at its fullest area and round the measurement to the nearest whole number. To calculate your waist circumference, use a tape measure. Start at the top of the hip bone, and wrap it around your waist at navel level. Ensure that it’s not too tight and that the tape is parallel with the floor. Don’t hold your breath while doing it. Stand sideways to a mirror and identify the fullest part of your hips. Wrap a tape measure around your widest area. The tape measure should be loose enough so that there is no skin depression. Record the measurement where the tape measure meets its end. Aussie fashion brand Cotton On has become a worldwide favourite for essential staples and statement-making style. Look to them for must-have trends, and grab the basics whenever you need to stock up.